Back by popular demand, here is my second installment of Dupe day. I have to say though, that I was very disappointed with these. 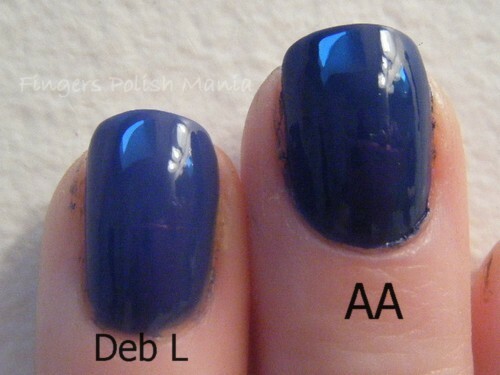 It's freaky that even though colors look the same in the bottles, they can be very different on the nail. These are all done with two coats, no base or top coat. This stains the crap out of my nails but I do it for you, my fans! 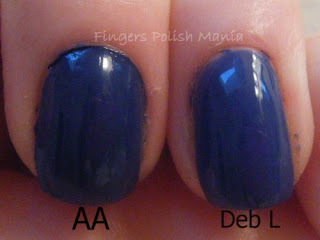 First up is the challenge between Deborah Lippmann I know What Boys Like and American Apparel Mount Royal. I had mentioned these may be dupes in a previous post. They look the same in the bottle, but the AA is somewhat darker on the nail. Also, the formula is so much better with the AA. 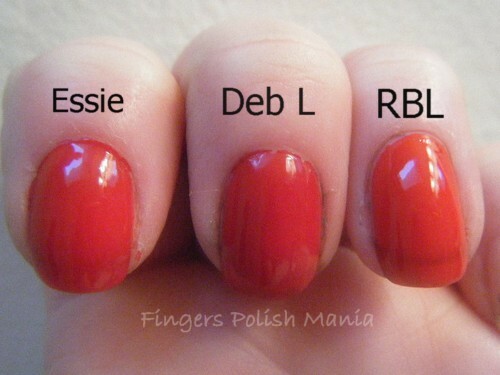 The DL lacks pigmentation and needs more layers. Next up, I did some reds. I had seen that someone searched for a dupe for Deborah Lippmann My Old Flame after my Smurf post. So I wanted to oblige that person. Now in these pictures, I DON'T have dirt under my nails. It's actually polish from doing these dupes. I should have done the lighter colors first!!! Anyway, this duel is between three colors. 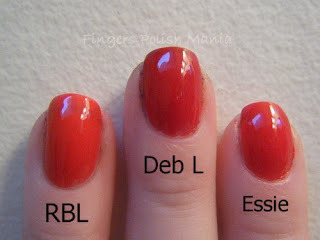 DL My Old Flame, Rescue Beauty Lounge Chinoise and Essie Forever Young. After I had done this post, I realized that China Glaze Phat Santa may be a contender, but it looks darker in the bottle. After comparing these, I think the Essie is pretty close to the DL. The RBL seems to have a bit more orange to it. And finally, the battle of the greens. 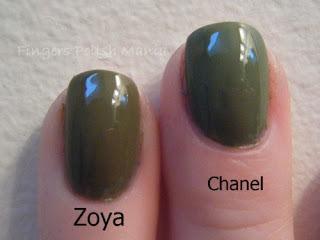 In this I pitted the new Zoya Dree versus Chanel Khaki Vert. These turned out to be two different colors that are similar in the bottle as well. The Zoya has more olive to it and is darker than the Chanel. I hope you have enjoyed the sequel to my Dupe Day. I am working on the trilogy! Are you enjoying these kinds of posts? Thanks! I love doing them-although my nails take a beating!! My next one is set for 8/2/11! If enough people like it, i'll keep doing it! Thanks for reading!! THANKS!!!!! I love the blue ones! I did this for you!! !